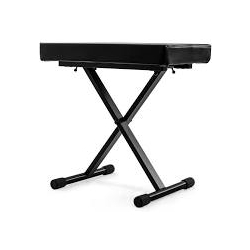 The Nomad NKB Keyboard bench is sturdy and easy to adjust..
Nomad Deluxe X Style Keyboard Bench NKB 5505 The NOMAD NKB-5505 Keyboard bench is designed for easy setup and tear down, has flexible height adjustments, and is made of heavy duty steel construction. The Quick-Adjust Levers allow for easy setup. Height adjustment range of 1924 with a weight capacity of 265 lbs. 12x23 Padded Seat contains 2 High Density Foam for enhanced comfort during long periods of use.